FACT CHECK: Greece Seizes Weapons Headed for Refugee Camps? Greece Seizes Weapons Headed for Refugee Camps? 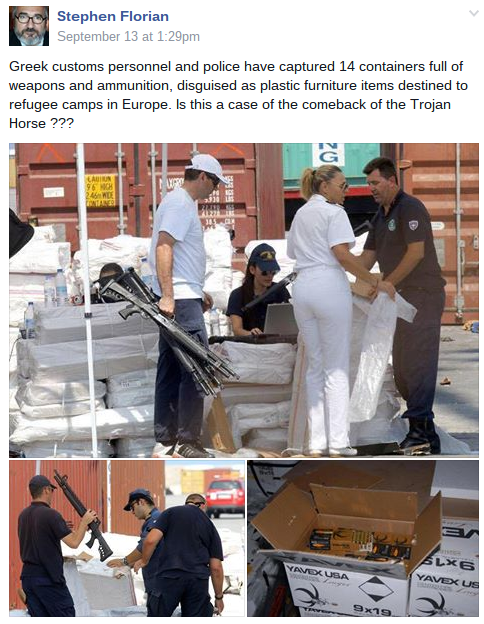 A shipment of weapons interdicted by Greek customs officials was not intended for refugees. Photographs show a cache of weapons uncovered by the Coast Guard in Greece, disguised as furniture and headed for European refugee camps. In September 2015, social media users in Europe and the United States debated the merits of accepting an influx of refugees from war-torn regions such as Syria. This seems rather strange to me and I’d like to know more, if you have anything further. Such as which refugee camps have been long-enough established and are able to make international orders for plastic furniture? Surely the refugees themselves aren’t ordering it up, and national governments are probably running any refugee camps and Germany is buying IKEYA beds in quantity, in Germany, for example. If a few thousand placcy garden chairs and tables are required, they are widely-available in every country on the planet and are probably manufactured in China and shipped direct from there in sealed containers with a lead time of several weeks. To me this all sounds a little implausible, but I could be wrong, it wouldn’t be the first time. A huge stash of weapons and ammunition has been found hidden aboard a cargo ship understood to be bound for Libya. Videos released by the Hellenic Coast Guard show officers uncovering the arms, which it said had no accompanying documents and were concealed by furniture and gym mats. So while the photographs shown here were captured from video of a September 2015 Greek coast guard weapons seizure, the arms in question were heading to Libya, not to refugee camps in Europe. 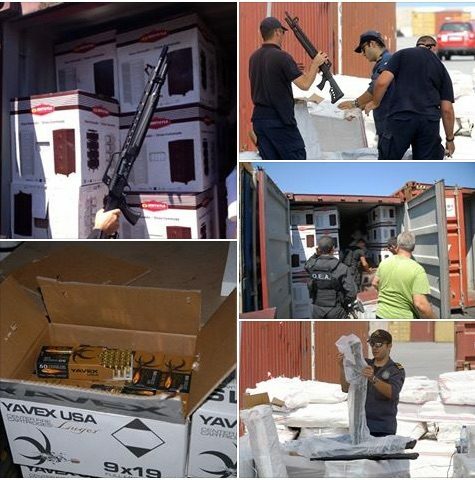 Greek Border guards found 52 tons of guns and ammunition in 14 Conex shipping containers disguised as “furniture” for Muslim immigrants. Note the discretion on the outside of the boxes. FOR YOUR INFORMATION–YAVEX USA IS A TURKISH ARMS MANUFACTURING COMPANY THAT IS LICENSED TO DO BUSINESS IN FORT MEYERS, FLORIDA!!! Brand new and still in their wrappers. All Automatic weapons!!! This is one of the first things I noticed and found odd…..why aren’t these “young men” fighting for THEIR country??? Then the Trojan Horse theory kicked in!!! These are the same tactics they tried to pull when we were in Iraq…nothing has changed!!! The smuggled arms had a compelling purported connection to Yavex USA and Fort Meyers, Florida in their September 2016 iteration, and some additional images were added to the original set. However, the original claim and images remained misrepresented, albeit with a novel hook inspiring American social media users to again share the rumor.